At Pilates by Design, we motivate our clients to reach their fitness goals and access their inner strength, helping them move through life with renewed strength, ease and grace. 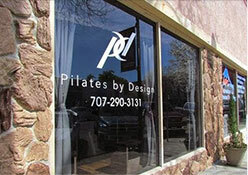 No matter your age or circumstance Pilates can help improve your quality of life. Pilates develops muscle strength, coordination, flexibility and balance using resistance and assistance in creative ways that help the body get to where it needs to be for optimal performance. Are you new to Pilates? Never been on a reformer before? Click HERE to get started! This will take your through the steps to begin taking classes. Please note that prior to starting classes an intro session or a Saturday Beginner class is required before taking class. This ensures that everyone stays safe and gets the most out of the class! Please contact us if you have any questions.